The Angling Trust and the Environment Agency release an additional £200,000 as part of the ‘Angling Improvement Fund’. The Environment Agency has released the extra money to be spent between now and the end of March 2016, sufficient to fund up to 50 additional projects. 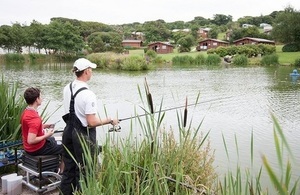 This move, which recognises the huge desire among anglers to develop their local facilities, has been made possible by good rod licence sales. The extra funding will be offered through rounds 3 and 4. Funding will be available to a wide range of freshwater angling providers, including clubs, commercial fisheries and angling projects, and there is no requirement to be Angling Trust affiliated. Projects must be located in England and involve a form of fishing requiring the purchase of an Environment Agency non-migratory and coarse Rod Licence. Awards of up to £5,000 are available for successful projects. The Angling Improvement Fund is just one way we use rod licence money to work with partners for the benefit of angling. Healthy rod licence sales have enabled us to be able to put yet more money into these projects. I’m looking forward to seeing great results from the third and fourth rounds, especially those which encourage young people to give fishing a go and those which rejuvenate under-used or neglected fishing spots. We are delighted to be able to distribute even more money to the country’s best angling improvement projects. We appreciate how disappointed many clubs and fisheries were to have missed out in Rounds 1 and 2 and so welcome the chance this extra funding gives us to look at those projects again. Funding will also be made available to new projects involving partnerships between clubs and fisheries and schools and for the creation, development and safeguarding of low-cost fishing at Community Waters, one of our National Angling Strategy priorities. The Angling Improvement Fund (formerly known as the Fishery Improvement Fund), administered by the Angling Trust, provides financial support for urgent facilities improvements at clubs and fisheries in England. It is one of the key elements in the new National Angling Strategic Services contract awarded to the Angling Trust as part of the delivery of the National Angling Strategy. So far this year the Fund has distributed £115,000 of Rod Licence income to 31 projects across the country. For more information on the Angling Improvement Fund and details of how to apply, please visit the Angling Trust website.